She lies awake listening to the storm. pristine walls. Bringing the outside in. plastic chairs sitting themselves down hard. And you lie close. Boats in safe harbour. content with life just lapping at your sides. as though they’d come to sort you out. Listen! wallow in it. See how they shake their fists. 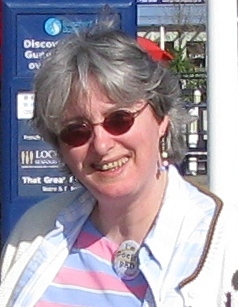 Founder of the poet-showcase site, www.poetrypf.co.uk, Anne Stewart is administrator for Second Light Network and co-edited several issues of ARTEMISpoetry. She was awarded MA(Dist) in Creative Writing from Sheffield Hallam University in 2003 and won the Bridport Prize in 2008. The Janus Hour (Oversteps Books, 2010) is her first collection.